The Fellowes Venus 125 pouch laminator is for frequent use in a variety of applications. The Venus2 125 Laminator features a 12-1/2" entry width for finishing large format documents. This machine offers a carrier-free, 6-roller system to help ensures high quality lamination for both documents and photos. The Venus2 125 includes multiple temperature settings for laminating pouches up to 10mil thick and a cold setting for laminating heat sensitive materials in self-adhesive SelfSeal pouches. The Fellowes Venus2 125 is ready to go after 30 seconds for 3 mil and 60 seconds for all other mil thickness. The Venus2 125 also has user-friendly features such as a green light and audible beep signal to let you know when the laminator is ready to laminate, and a reverse mode to help disengages pouches for re-centering or removal. Much like a desktop printer, the lid of the Venus 125 can be opened for cleaning, maintenance, or removal of missfed sheets. 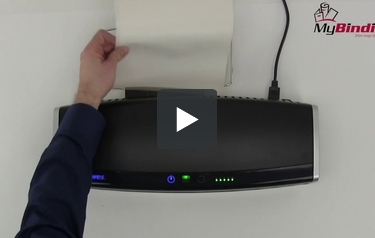 This is a unique feature among pouch laminators and can help prolong the life of your machine vs. other less accessible machines. Product Number 5734801. The best laminator for heavy office use. Rapid laminating speed up to 43" per minute. Laminates hot pouches up to 10 mil thick; as well as cold pouches. Advanced Pouch Tracking System detects and reverses pouch in case of mis-feeds. Feed IQ drives maximum productivity by alerting user when they can insert their next pouch. Robust 6-roller system for superior lamination quality. Includes laminating starter pack (contents: ten 3 mil letter pouches). Laminating Speed (inches p/min):	Up to 43"
Dimensions:	5" x 21.25" x 8.25"
We were very pleased with this laminator It performs as advertised! So much quicker than our old laminator!!! Would definitely recommend!! This laminator is perfect for what we needed. It laminates 3x faster than our previous laminator and is very easy to use. I purchased the Fellowes Venus 2 125 about two years ago from MyBinding. I was using an older commercial model laminator in student services prior to this but it took too long to heat up and the quality was really not that good when using 5-7 mil pouches. The first time I used this machine, it was warmed up in a matter of seconds. The lamination came out perfect without bubbles or creases. I don't use the cardboard - I run the pouch directly through. Mainly I laminate card stock (#80 to #12 0uncoated and coated) and use menu size 7mil pouches. Every time the finished product is flawless. After 2 years of fairly heavy use in the print shop, I have to say I am impressed. I bought another one for the office staff and they have been using theirs for almost as long with no problems at all. If I ever need another laminator I know which one I will be buying. MyBinding offered a much better price than other options I found. We've had no problems laminating using 3mil & 7mil sheets. So far, the office staff is very satisfied with this choice. Haven't used it much, but it's easy to use and seems like it will be good. The cost of the item from My Binding was cheaper than the same item at Staples or Office Depot, so that was great! I use it to laminate card stock with 3 mil, 5 mil, 7 mil, and 10 mil without having issues. It's wonderful! My first experience using a Fellowes product, and I must say I am impressed with the overall build quality of the Venus 2 125 laminator that I purchased. It has been performing flawlessly. Moreover, it appears that Fellowes is not just satisfied with creating and designing quality products that work well, but they are paying attention to bringing to market products of superior aesthetic appearance as well. Bravo, Fellowes!! I consider this review a 'no brainer'. Why? First off, you are dealing with a time proven company.. Fellowes .. Not only does this company have high quality products that stand the test of time and have been doing it for years, they believe in their products and stand behind then with quick responses to any questions you may have and are there if you ever need them. This Venus2 125 Laminator has the fastest warm-up time, no more concern as to what thickness pouches you are using. Everything is automatic and the final product comes out picture perfect every time without any bubbles or any other imperfections. The unit is very well built, solid and good looking. I can't say enough about this laminator.. GET IT you WON'T be disappointed..
A good laminating machine that can use various mil pouches. Welcome to MyBinding video. Today we take a look at the Venus2 125, a 12 1/2 inch pouch laminator by Fellowes. The Venus2 125 is a laminator for frequent use in a variety of applications. It has a 12 1/2 inch throat opening, so pouches up to 12 inches wide are no problem. The controls in the Venus2 are right here on the top and they're touchpad - power, as well as going from heat to cold, it auto senses the thickness of your document and runs it through appropriately. The Venus2 does not require a carrier, however here at MyBinding, we encourage you to use a carrier to prolong the life of your product. Your laminating projects go in the front and come out the back on the finishing tray. It can handle from 3 to 10 mil in pouch thickness and is great for hot and cold documents so you can preserve photos and pictures, as well as laminating and securing important documents. It can warm up in little as 30 seconds and is great for small and large projects. Plenty of tools to help you in the front to guide you through the process. Audible beeps will help you know when things are ready to go and your project options are simply limitless. That's the Fellowes Venus2 125 pouch laminator. For more demos, reviews and how to's, check out MyBinding.com. Entry width - in 12.5" 12.5" 12.5" 12.5" 9.5"
(inches p/min) Up to 43" Up to 30" Up to 24" Up to 19" Up to 19"
Dimensions 5" x 21.25" x 8.25" 5" x 21.25" x 8.25" 4.75" x 20" x 5.5" 4.25" x 22.5" x 6.25" 4.25" x 17.75" x 5.75"
Thank you for your question. I am sorry to hear you are having issues with your laminator. To address technical issues the best first step is to contact the manufacturer's technical support department. The manufacturer is Fellowes and their phone number is 1-800-955-0959. If they are not able to assist, we are based out of Oregon, our service areas are OR,WA, IL and southern CA. If you are in one of those areas contact us and we can set up a service call. If you are not in our service area we would refer you to a 3rd party nation wide service provider Serv Right, their phone # is 1-800-642-6015. Please let us know if you have any other questions or concerns. Better machine - Swingline GBC 5000L or Fellowes Venus2 125? Also do you send samples of 5 7 or 10 mil thickness for 5 x 7 plant signs. Thanks! Thank you for your question. They are very similar machines in function and capability, I would lean toward the Fellowes machine because it has the 2 year warranty vs the 1 year with the Swingline machine. For sample requests please reach out to our customer service team either through live chat,by e-mail at Sales@mybinding.com, or by phone at 1-800-944-4573 and we would be happy to coordinate with the manufacturer to get a sample out to you if they have one available for the product.